A composition for electronic instruments and voice. It is his 1st LP album (1989); a personal initial proposal for the use of music technology means. This work participated and was awarded a prize at the “Soundscape” Pan-European Competition of Musical Composition and Technology (Norwich, Great Britain). Lyrics by Hariklia Vassiliou. Sung by Katerina Karatza. Later it reappeared in a CD form (in 1995) along with his 2nd LP album, “Beatrice”. A composition for a series of works by painter Herman Blaut. A only 15min piece but of decisive importance. As a continuation of the problematics about music technology that started with “Onar”. As a clear view about relating music with fine-arts. As the core of the dance / theatre performance “Isimeries”. A work for voice, guitar and violoncello. 2nd LP album. Lyrics by Hariklia Vassiliou, Christina Mitsani, Tina Stefanopoulou. Sung by Spyros Sakkas. “Beatrice” was published on 1995 as a CD together with “Onar”. It is also the first part of a broader work, entitled “Two love cantatas” (the second part is “3000 Years of Being in Love”, which never appeared in the discography). 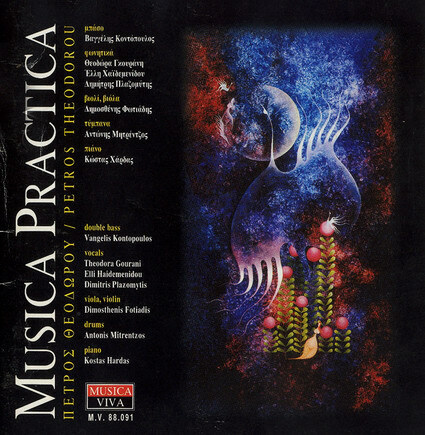 A composition in a cantata like form for piano, flute and voice dedicated to Spyros Sakkas (1993). It was presented at live recitals (sung by Sakkas) along with “Beatrice” under the title “Two Love Cantatas”. Lyrics – libretto by Stephanos Rikoudis. A work based on the composer’s personal proposal for a creative approach of music technology, a route that started with “Onar”. With this work Theodorou developed his concept of “Musical Praxis – Action”. He created a series of pieces with no aesthetic prejudices using electronic sound with an astonishing stylistic freedom. 3rd discography (CD -1995). A work for a dancer, a “Theremin” (the monumental electronic instrument in the beginning of the century), and pre-recorded music made up exclusively by Theremin samples. This experimental piece was completed in co-operation with dancer Efi Tsolakidou (1997). 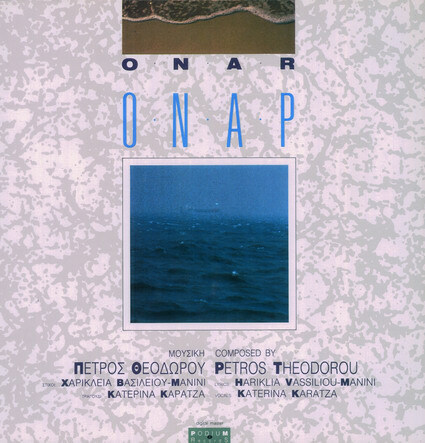 A composition of spoken text and sound based on a Dionysios Solomos’ story (text interpreted by the actor Dimitris Karellis (1998). It is made on the classical radio-theatre style (yet, in this case there is a monologue, regarding the text). The music is all original, implying numerous samples very subtly and thoroughly elaborated. It is not simply a mood-decorative “sound-carpet”, since it is composed to follow very closely the narration. The whole idea of such a kind of work was much further developed later, in the last Theodorou’s composition, which was the audio part of the project “Ars Moriendi”. This work was officially released in a CD form in 1999 when Theodorou developed further a composition of 1995. At that time Theodorou had the idea of creating an independent performance based on this tragedy that would be structured with just sound and movement without words, a project similar but much more ambitious than “Isimeries”. During the next 4 years he wrote the fully detailed sound / movement performance “script”. He cooperated for this purpose partly with the dancer Efi Tsolakidou. He completed the musical part developing much further that first version of 1995, transforming it in a stand-alone work which is the composer’s 4rth discography (CD, 1999). During the same year (1999) he co-operated with dancer / choreographer Amalia Strinopoulou working on the pre-existing conceptual core of the complete performance. 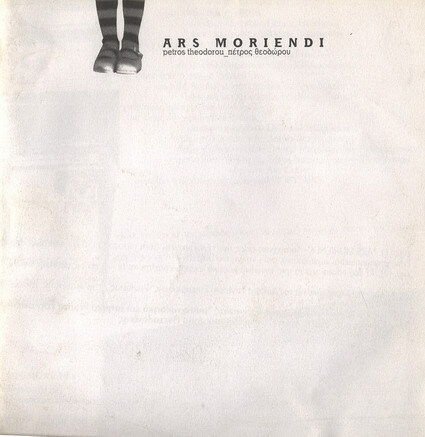 The final result, entitled “myth fragments: Phoenisses”, was presented in the “Dimitria festival – 1999”. This work is a definitive turning point in the composer’s proposals on music technology (a pathway that opened with “ONAR” and went on with “MUSICA PRACTICA”). Furthermore, this work, is a totally idiosyncratic personal perspective on aesthetic and stylistic references to the Greek traditional sound. The slides are projected while the sound part is heard. The images can be exhibited independently from the rest of the presentation. As a “stand alone” conceptual content, they are different than the original work’s one. Whenever were presented in an exhibition, they were entitled “…the dream of a city that no longer remembers breathing…” since the idea of the city and the urban environment are its main themes. “Nostalgia”, “Mutation”, ” Night Pieces”, “8 Children’s Songs”, “De retum natura”, “Tauil”, “Topos”, “Anaplous”, “Spira”, “A Suite for a Young Girl Dancer”, “River Song”, “An Emperor’s Afternoon”, “Deja vu & Eight Familiar Images”, “Aetherogenessis”, “Song for a Monolith”, “Dangerous Confrontations”, “Barrier”.